Charity Shumway Archives - Book.Blog.Bake. Back on one of my Top Ten Tuesday posts, I wrote about how I wanted more books that were set in college or directly after college without a lot of romance., and someone recommended Ten Girls to Watch to me. Well, at the time I had quite a bit of amazon gift card money leftover from Christmas, and I happily ordered a very cheap used copy on Amazon, but I just hadn’t felt in the mood for that type of story recently, until about a week ago. There are quite a few things I really like about Ten Girls to Watch. I like Dawn as a character. She’s believable and honestly, quite similar to me. She has a dream that she’s working towards, but she’s not an instant success story, which is something that I loved. So often you’ll read a story where the main character is a struggling, aspiring actress or writer or singer or what-have-you, but by the end of the novel they have a record deal or have written a book or have become really well-off. Dawn definitely leaves the story in a better place than when she started, but it’s not like she want from online writer to magazine editor-in-chief in a year. As someone who’s currently staring down her college graduation, it was really quite comforting. I liked seeing all the different women that Dawn interviews for the Ten Girls to Watch feature. It really highlights how many different ways there are to be inspiring and be successful. One of the women was a first grade teacher for forty years; another wrote a novel, and both of those are celebrated as achievements, as well as many others. It many ways, this book is all about celebrating success–but not the type of narrowly defined success we normally see. You’re a politician? Success. You’ve been happily married for thirty years? Success. There were a few things I didn’t enjoy with this book, however. There’s a few love interest, none of which take up that much page time, but none of them caught my interest. None of them were terrible human beings by any means, but they weren’t particularly interesting either, and I found myself bored during the time when Dawn was really concentrating on a guy, which might have been while the middle of this book dragged for me a little. The book’s pacing seemed a little off; I could have done with some more complications in the middle and less towards the end. However, neither of these complaints severely hindered my lack of enjoyment in the novel. Final Impression: An enjoyable read with a character whose story line is both compelling and realistic. Though there were a few minor issues with this book, especially in the middle, this is still a book I would highly recommend, especially since it focuses on the year post-college graduation, which I wish to see more of in books. I particularly like how this book celebrates achievements. A (strong) 3/5 stars. 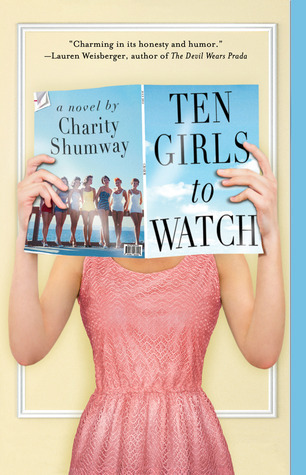 You can find Ten Girls to Watch at Amazon, Barnes and Nobles, or the Book Depository.